"This is a very mild and yet savory bisque, it is very good served on a cold winter night!!" Reserve 2 tablespoons sliced scallion tops for garnish. Cook and stir remaining scallions in the vegetable oil in a medium sized saucepan over medium heat for 1 minute. Stir in flour until smooth. Gradually stir in milk; cook, stirring until mixture thickens and boils. Cook and stir for 1 minute more. Add lobster, half and half, sherry, white pepper and salt. Cook and stir until heated through. To serve, ladle soup into bowls. Garnish with reserved scallion tops. Simple, Delicious and elegant! This was the perfiect second course for my light three course dinner on Valentine's Day! Thank-you! Rich, yet smooth and light. This was really bland, kind of like lobster meat floating in thickened milk. The best part about it was the lobster meat, which would have been better used in another recipe. this is quick and easy recipe. It's not bad- If taste is not important to you. I thought this recipe was horrible. I was highly disappointed with the way it turned out. As someone else stated, it tasted like warm milk with lobster cubes in it. I would suggest that when making bisque, you allow it to mellow overnight. 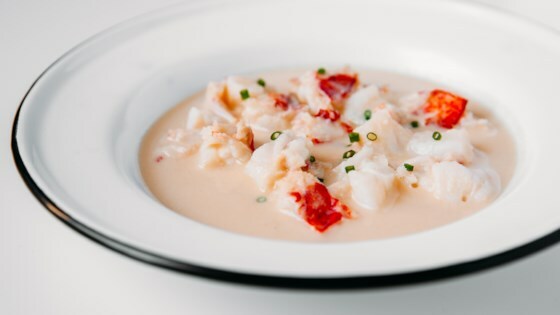 The flavors are much more intense when the lobster infuses the broth.